With the incredible success of Wing Commander, Origin pioneered the concept of game expansions with the Secret Missions add-on disk. Fans of the first title in the series were treated to an intense campaign where the pilots of the Tiger's Claw were tasked with an important covert operation. A new Kilrathi superweapon was being tested aboard the Sivar Dreadnought. Although the Claw hurried in response to its distress call, the populous Goddard Colony was annihilated before help could arrive. The Claw was the only ship in position to penetrate deep behind enemy lines, pick apart the fleet that attacked Goddard and ultimately destroy the Kilrathi secret weapon. Wing Commander: The Secret Missions is another thrilling chapter in the continuing saga of the TCS Tiger's Claw. A human colony has been obliterated by the Kilrathi. Now they challenge the defenders of humanity to a deadly game of hide and go seek. You must cross into enemy space in pursuit of the Kilrathi strike fleet, only to face their latest secret weapon…a weapon capable of destroying an entire world. YOU ARE HEREBY ORDERED TO DIVERT FROM VEGA SECTOR TO GODDARD COLONY IN DENEB SECTOR. TERRAN INTELLIGENCE REPORTS PROBABLE KILRATHI ATTACK. ALL COMMUNICATION WITH GODDARD LOST. UPON ARRIVAL DEFEND COLONY AND DESTROY ENEMY. GOOD HUNTING. is another thrilling chapter int he continuing saga of the TCS Tiger's Claw. A human colony has been obliterated by the Kilrathi. Now they challenge the defenders of humanity. to a deadly game of hide and seek. You must cross into enemy space in pursuit of the Kilrathi strike fleet, only to face their latest secret weapon..a weapon capable of destroying an entire world. Play an all-new, 16-mission campaign offering unparalled (NOTE - Misspelling is original text) intensity, new missions and goals, and higher levels of excitementthan ever before. Thrill at the sight of stunning graphics as you encounter 4 new ships - from eight-man Confederation fighters to the Sivar-class dreadnought, pride of the Kilrathi fleet. Transfer your Wing Commander character and continue your personal quest to defeat the Kilrathi. 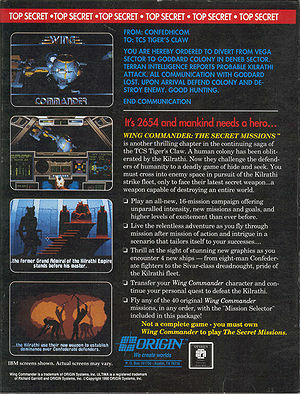 Fly any of the 40 original Wing Commander missions in any order, with the "Mission Selector" included in this package! 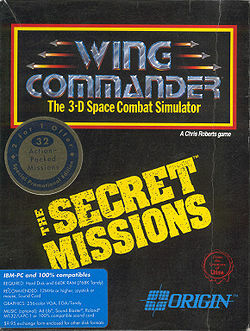 Not a complete game - you must own Wing Commander to play The Secret Missions. Children of the nineties such as myself may remember back when Nintendo Power was full of awful SNES game related comic strips... what you may have forgotten (or blocked from your mind) was that back then Wing Commander and The Secret Missions were Nintendo games! This comic is scanned from a 1992 issue of the magazine. Lost part of the Wing Commander canon or an excuse to stab your own eyes out and scream in terror? You decide! Clicking on the system name will bring you to the first mission in that system. This page was last edited on 10 August 2013, at 16:31.